Home » Cryptocurrencies » Want To Get FREE Cryptocurrencies? Read This Guide! Perhaps nobody is so naive to believe that you can get some things absolutely for free. As to cryptocurrencies, this may sound foolish. Nevertheless, today I will show you some possibilities of how you can get cryptocurrencies without having to pay for them. All they will cost you is some effort and time. Quite surprisingly, these methods work! If you have a few extra minutes to earn some crypto or, just want to try out a new method of investing continue to read. It doesn’t matter if you use your computer or phone. You can also do it when commuting by public transport. Let’s start with good news: There is not only one possibility to get free cryptocurrencies. There are more. We are going to take a closer look at a few of them. I though various PTC sites had been relegated to history. I don’t know how about you, but I came across them at the turn of the century or a few years past. At that time, there were several PTC websites such as Neobux (still running) where you could sign up and let ads run in a window. In those days, the paid-to-click business was a great boom. It allowed you to earn a few bucks by clicking and after reaching a minimum level, to get paid. Your payment was sent to an electronic wallet, mostly by PayPal. People with this experience know very well that clicking adverts can’t make you a millionaire and that it is a waste of time. The only way to make some profit in this field was to invite new people through your recommendation in the form of referral code. This would allow you to get some commission from registration plus from the clicking carried out by the invitees. If the number of invitees was large enough you could earn an interesting sum of money. Let’s get back to cryptocurrencies. The above-described clicking business exists also today with cryptocurrencies. There are various services called crypto faucets e.g. ethereumfaucet.info or freebitco.in. You can either get registered or not, but what you have to do is to enter the code of your virtual wallet (we’ll talk about it later) and then you can look at the adverts etc. To make it more practical, we have the faucets for you. 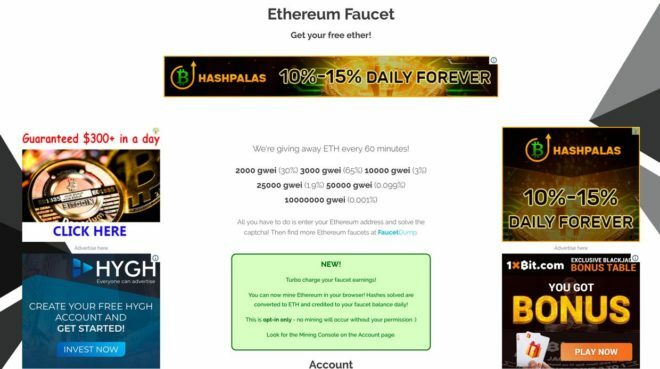 Open the website EthereumFaucet and take a look at the advertisements presented there. Enter the address of your ETH wallet to get free ETH! It takes 20 seconds until the system allows you to enter the address. During the first 20 seconds, all that you see when clicking on the box with the wallet link is advertisements and commercials. After taking a quick glance at some casinos, match-making sites, or online series I closed them and quitted. However, if you manage to lure a sufficient number of invitees to click using your referral code you can effortlessly earn decent money. All that you have to do is to spread your referral code over the social media, publish it on your blog or in other places and, after achieving plenty of registrations, you can make some profit. But if you try to earn money clicking on ads without doing anything else, believe me, it is a road to nowhere. The website FreeBitco.in is a little bit more sophisticated than the above faucet. This website requires to open an account using your e-mail address. Next, it allows you to randomly pick a number from 0 to 10 000. 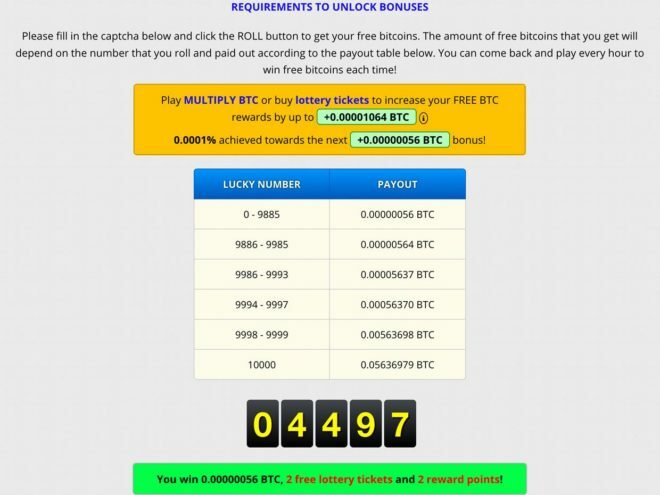 Depending on the number that is drawn you will receive a free reward in bitcoin. This is most likely (at 99%) the lowest prize, currently amounting to 56 satoshi. What’s interesting about this site is that it offers you the opportunity to multiply your earned satoshi. The “Multiply BTC” option features a game which allows you to repeatedly generate random numbers and guess with your satoshi whether the drawn number will be a bigger or smaller one. The minimum withdrawal is BTC 0.0003. FreeBitco.in offers a referral program, too, a better alternative to earn money. 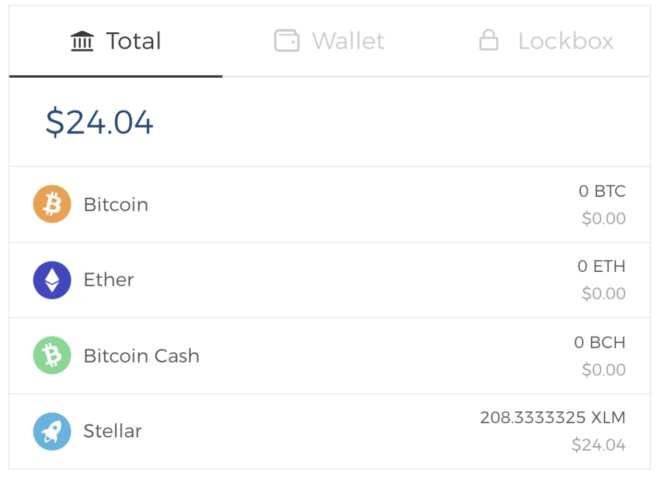 If you want to get free Stellar Lumens all you have to do is to open an account on the Blockchain.info. A few days after your registration, you will receive an e-mail containing the next steps. I’ve got XLM in my wallet already. I can instantly exchange the coins for a different coin (such as BTC) or withdraw them from the wallet. A second and, in my view, a more pleasant way are airdrops. New firms (typically start-ups) are launching new funding opportunities by using ICO (Initial Coin Offering). (Un)fortunately, the number of these firms is so big that you get lost and to push them through by marketing is impossible. Instead of advertising, which might remain overshadowed, the firms use airdrops. There are three forms of airdrops. A startup picks up a well-established currency and sends its new currency at a certain ratio to all holders of the currency for free. For example, all holders of ETC will receive a free xz coin at the ratio of X to Y.
I can announce my intention in advance or, without any announcement, pick up a few active wallets. The user will see that he has received something. Maybe it will draw his attention encouraging him to use the crypto or, at least, to learn more about this topic. If you have been in this crypto-business for some time you surely remember the bitcoin/bitcoin cash fork. In simple terms, the existing code was copied and you, holding 1BTC, received one free bitcoin (or a fraction of bitcoin). 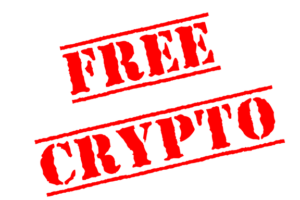 Why this happened is described in our next article; the key message is that now you will receive the given cryptocurrency for free. Remember that the majority of new coins will not survive and, at the end of the day, you may end up keeping a few valueless coins. I guess that one out of ten may retain some value and one out of twenty even succeed to bring you a decent profit. CoinBase cryptocurrency giveaway (for free)! A few weeks ago well-known cryptocurrency exchange CoinBase launched a new program (educative materials) called CoinBase Earn. Thanks to this education material you can go through basic lessons and answer simple questions about certain cryptocurrencies and get them completely free. The main goal of this program is probably to get cryptocurrency among the public, and the money people receive is a form of marketing investment from the authors of that certain cryptocurrencies. Go and get them! To get free cryptocurrencies might be easy. As far as airdrops are concerned, you should check Airdropalert.com to at least keep up with the latest trends in the crypto world. Sharing communication via Twitter, making a few calls with your handset on the journey from work or while waiting for a coffee will also help. If you have a blog with plenty of people sharing texts or images with you on social media you can opt for faucets (…this, however, requires a vast network of contacts).